How are the forests in Africa doing? What are the most cost-effective climate actions and can deforestation be slowed down? Is there demand for sustainably produced wood? Why is it so difficult to get private funding? What could the EU do? Forests, food production and climate change are closely linked to one another, professor Markku Kanninen reminded. 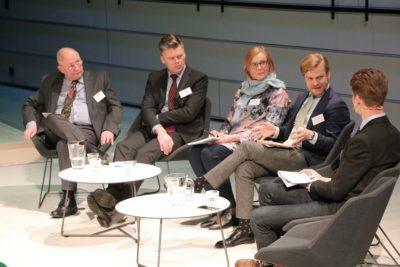 These questions were discussed at a seminar co-organised by WWF Finland, Viikki Tropical Resources Institute at University of Helsinki (Vitri) and Finnfund in Helsinki on 5 March. “Forests are so much more than carbon sinks. They are very important for biodiversity, they prevent erosion and help maintain water supplies. Forests can be a very important source of both well-being and income, especially in the rural areas of Africa”, said Anne-Mari Virolainen, Minister for Foreign Trade and Development, in her opening speech. Markku Kanninen, professor of Tropical Silviculture, opened the first discussion by talking about how the forests in Africa have changed and what kind of effects they have had on climate. Forests, food production and climate change are closely linked to one another: the low productivity of agriculture leads to deforestation – while at the same time the expected population growth and the effects of climate change threaten food security. ”Availability of clean water will be one of the biggest challenges in Africa. Water will be one of the most important ecosystem services that forests provide. Forests and trees have a significant role in securing the quality and amount of water”, said professor Kanninen. Discussion between Markku Kanninen (left), Jari Liski, Riitta Oksanen and Aleksi Heiskanen. Professor Kanninen was joined onstage by Jari Liski, Research Professor from Finnish Meteorological Institute, Riitta Oksanen, Director General of the Development Policy Department at the Finnish Ministry for Foreign Affairs and Aleksi Heiskanen, International Development Expert at WWF Finland. Particularly the connection between forestry and agriculture prompted discussion. “Agriculture and forestry do not rule each other out; they go hand in hand. It’s been like this for hundreds of years”, reminded Kanninen. “I agree. Much can be built on existing systems that have been used for a long time”, Ms. Oksanen said. Everyone seemed to agree on that we need sustainable solutions that create alternatives to harvesting forests. “If local people feel they can benefit from the forest, they will not destroy it. It’s very simple”, concluded Kanninen. The second panel discussion with Andrew Collins (left), Ilkka Norjamäki, Mikhail Tarasov, Nils Behrndt, Thomas Selänniemi and Hanna Skelly on stage. Moderator was Jarno Hartikainen. In the second discussion the focus was especially on the role of the private sector and cooperation between different operators. The introduction was provided by Andrew Collins, Chief Executive of Miro Forestry which operates in Ghana and Sierra Leone. The company has been funded by Finnfund since 2014 and operates FSC certified forests and sources wood from smaller actors. At the same time, a large part of the company’s forests are conserved. Even if the company has in many ways been a success story and a pioneer in sustainable forestry in West Africa, it hasn’t always been easy to convince the financiers. 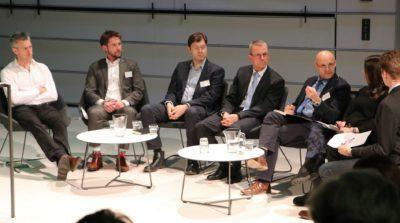 “Finnfund played an important part in getting us started and convincing other investors. At the same time, financiers such as Finnfund want us to conserve more than the 10 percent of the land required for the FSC certification”, says Collins. More insights from financiers were shared when Collins was joined onstage by Nils Behrndt, Head of Cabinet for the EU commissioner for International Cooperation & Development, Mikhail Tarasov, IKEA Global Forestry Manager, Thomas Selänniemi, Head of Sustainability at Indufor, Hanna Skelly, Managing Director of ArbaroAdvisors -forest fund and investment manager Ilkka Norjamäki from Finnfund. According to Collins, not many investors are ready to invest in sustainable forestry in Africa even if they are interested in it in the long run. At the same time, he reminded that for example Brazil was in exactly the same situation some decades ago. Investment periods are long, logistics is often challenging and forest expertise is quite new. 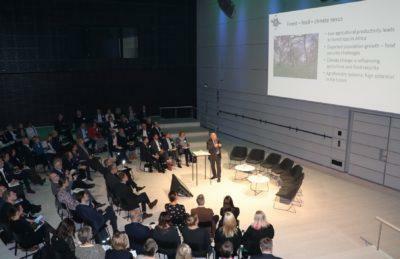 ”Finnfund is a long-term investor who believes in sustainable forestry in Africa – especially in the companies we invest in. Miro Forestry is an excellent example of this”, said Norjamäki from Finnfund. 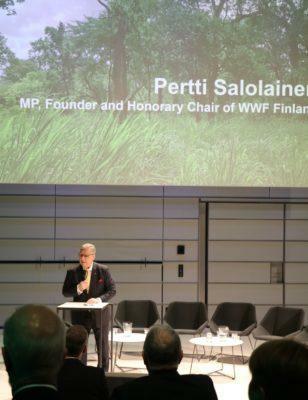 “In order to save the world’s natural forests, we need planted forests”, said the honorary chairman of WWF, member of Parliament and member of the Finnfund supervisory board Pertti Salolainen in his closing speech. Even if Tarasov from IKEA said he believes in growing demand of sustainable wood even from China which has been active in African forests, IKEA still doesn’t buy any wood from Africa yet – even though they are the biggest buyer of wood in the world. Tarasov considered it possible in the future. IKEA buys 80 million cubic meters of wood per year and they demand it to have an FSC certificate or be recycled. “China is a big competitor for us”, concluded Behrndt as a voice from the commission. “Africa is not just a poor continent, they can actually choose their partners. We must use both political and economical power to promote the European standards that we require”, said Behrndt. The European Union is preparing a new external investment programme with sustainable forestry in Africa as one possible goal. The members of the panel as well as many commentators in the audience expressed the need for different actors to cooperate in both funding as well as developing both sustainability and knowledge. “We need cooperation between countries. Working together on education is really important – companies can’t be responsible for everything”, said Norjamäki.